Experience the Newly Transformed Crowne Plaza Atlanta Midtown Perfectly situated between Downtown Atlanta and Buckhead, and renovated in 2016, the Crowne Plaza Atlanta Midtown is the ideal location for both Business and Pleasure. Every detail about this new hotel has you in mind. Spacious, modern Guest Rooms with unbeatable views of the Atlanta Skyline offer efficient, user friendly work and living spaces with free Wi-Fi throughout. 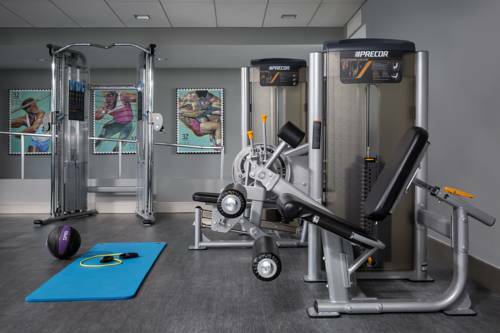 Recharge with a world-class fitness center equipped to meet the most demanding personal workout regimen, or relax in the seasonal outdoor pool. Enjoy socializing with colleagues and friends in chic restaurants, outlets and innovative public areas. Now open, THRIVE Coffee Shop, FIRST and NEXT Restaurants, and the 24-hour grab-and-go MARKET, provide delectable bites and sumptuous coffee and beverages. Whatever the reason for your visit, experience new southern hospitality at the Crowne Plaza Atlanta Midtown. The Varsity: World famous hot dogs, hamburgers and more, the world's largest drive in restaurant opened in 1928. Coffee Shop: We have a high quality cafe located in the main lobby providing patrons with the finest in freshly brewed coffee, espressos, cappuccinos, specialty drinks, and fresh baked goods. Ecco: A favorite of locals and celebrities, many movies have been filmed here. Two Urban Licks: American Rotisserie fare with live blues at this warehouse restaurant with city views, just east of Midtown. NEXT Bar: NEXT Bar is an upscale, energetic bar featuring local craft beers, artisan cocktails, and all your traditional favorites. NEXT Bar is the perfect place to unwind after a long day of meetings or sightseeing. Georgia Ballroom: Whether you are searching for a place to hold an end-of-the-year corporate function, holiday party, or quarterly meeting, we aim to make your event the best it can possibly be we are equipped with 31,000 square feet of available meeting and event space. Atlanta Ballroom: Atlanta Ballroom is flexible banquet space that divides into 4 sections. Each of the rooms have structural sound baring airwalls. This space is very unique and can accomidate different groups. Peachtree: This conference room is comfortable for small breakouts or presentations. Piedmont: Ideal for a small training room or expo. Roswell: This conference room is comfortable for small breakouts or presentations. Lenox: This conference room is comfortable for small breakouts or presentations. Buckhead: This conference room is comfortable for small breakouts, meetings, or presentations. SKY EAST: Floor to ceiling windows, dramatic views of Atlanta, Exceptional Ballroom Space for Receptions, Galas, Parties, and Weddings. SKY WEST: Floor to ceiling windows, dramatic views of Atlanta, Exceptional Ballroom Space for Receptions, Galas, Parties, and Weddings. SKY BOARDROOM: Floor to ceiling windows, dramatic views of Atlanta, Executive Boardroom.